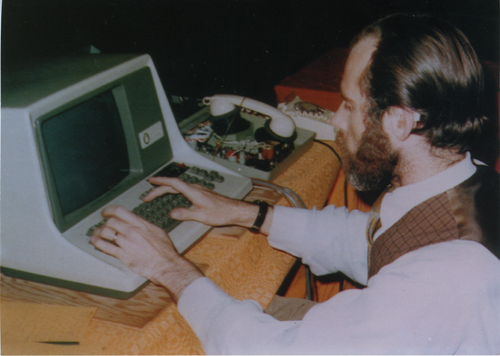 This is a color image of a Vinton Cerf demonstrating ARPANET in South Africa. It was done in conjunction with a conference sponsored by the International Federation of Information Processing Societies (IFIPS). Mr. Cerf's typing into the terminal and facing away from the camera. A modem with its cover removed is in the background and a white telephone is connected to it. Mr. Cerf is wearing a white shirt and tied and a checkered vest. Written on verso side is "2" and is circled.